The resources listed below serve to help guide and direct you in your Accreditation journey. Can't find what you're looking for? We are here to assist you; please contact us here. Is this the right case type for Accreditation? Learn more with AACD's case type reference. This document outlines the magnification ratios for non-retracted, retracted, and retracted views using a mirror. This document serves as a means of categorizing examination findings. What is Accreditation? How many people are Accredited? Get answers here. Purchase the Guide to Accreditation Criteria, the Guide to Accreditation Photography, and other printed resources. 3. Oral Examination A preview of the Guide to Accreditation Criteria and Accreditation Photography. Access the Microsoft PowerPoint template here. 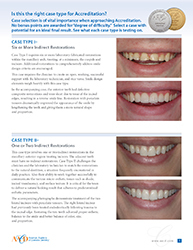 See examples of case types here. Download or purchase hard copies of this handy 24-page Accreditation Resource Guide. Tips for finding clinical cases. Required photo release forms for dentists and laboratory technicians submitting Accreditation cases. An example of a written report submitted by a dentist for Accreditation. An example of a written report submitted by a laboratory technician for Accreditation. The required Accreditation and Criteria Workshops available within AACD's Virtual Campus and additional opportunities for Accreditation.